We lovingly grow dozens of varieties of classic and heirloom flowers, including sweet peas, ranunculus, anemones, peonies, dahlias, lisianthus, zinnias, cosmos, statice, celosia, sunflowers, snapdragons, and more! We also love more unusual and quirky blooms, such as sea holly, love-in-a-mist, and snow-on-a-mountain, and greenery, vines, grasses and grains like frosted explosion, Job's tears, millet, and hyacinth bean vine. Our sustainable growing practices mean that your flowers are never treated with chemicals and should last, in fresh water, in your home for at least a week. In Summer 2019, we will be introducing our first Pick-Your-Own Flower patch! Flowers CSA: We have opened up two more spots for 2019! 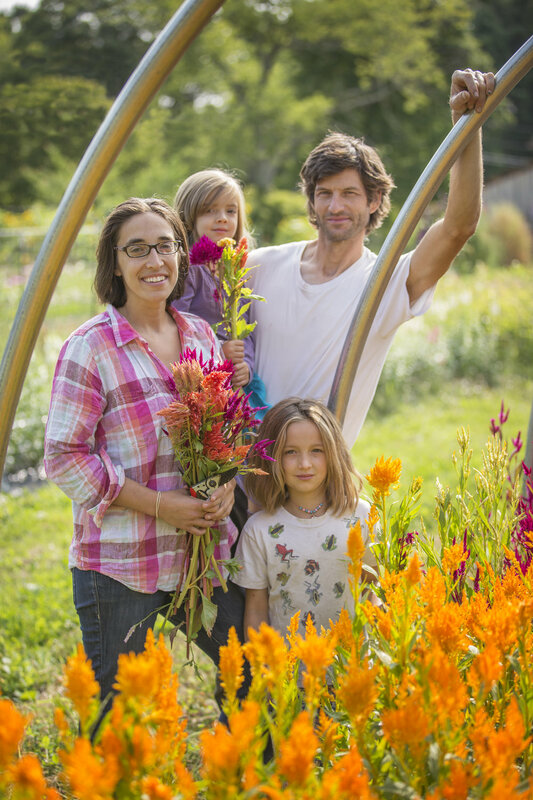 Sign up for a Flowers CSA share for 12 weeks of bouquets bursting with fresh, colorful blooms, from mid-June through mid-September. Each week's bouquet is different! Pick up at the farm each Wednesday (between noon and 6pm) from mid-June through mid-September. $200 for the season.